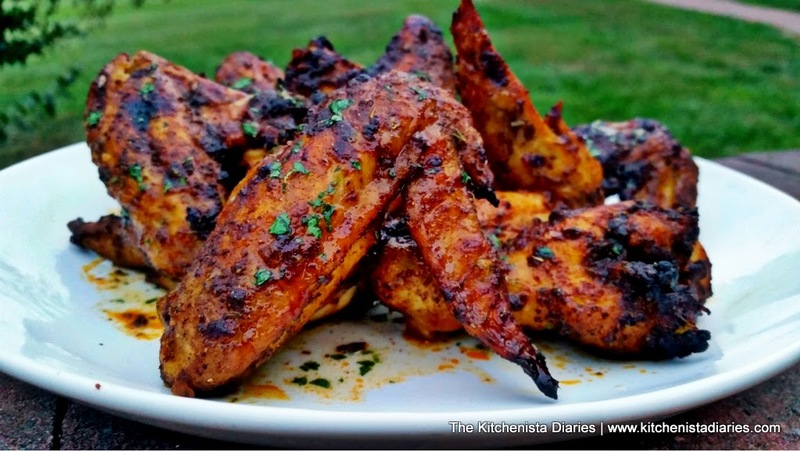 What better way to kick off football season than a new chicken wing recipe? 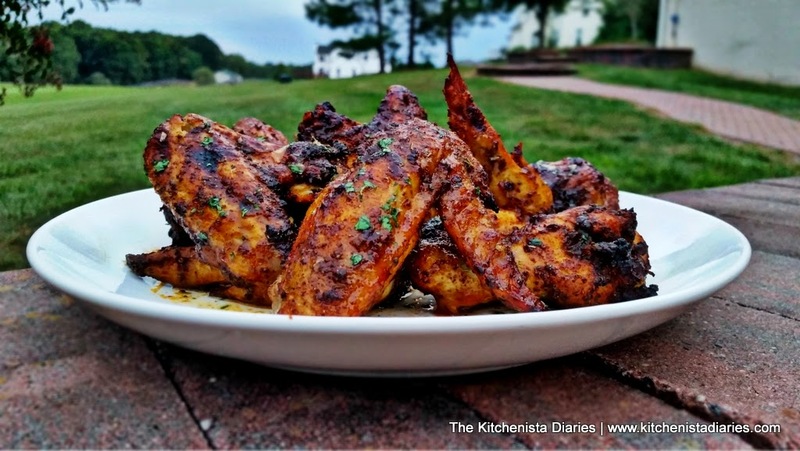 It's been a little more than a year since I shared my recipe for the perfect buttermilk fried chicken wings, and I'm back with another keeper. Regardless of how great (or terrible...hey Redskins!) your team is playing, when you serve these crispy roasted wings at your next party, you'll be the real MVP. This chicken is exploding with flavor from the inside out, thanks to a buttermilk brine, flavorful cilantro chile spice rub and a honey lime drizzle. This brine-rub-sauce is a 3-step formula that I don't veer far from when cooking my wings in the oven and really helps to build layer after layer of flavor while keeping the meat juicy and succulent. And the skin? Crispier than you'd ever believe could happen without a deep fryer. With the right tools and techniques, you can certainly enjoy oven roasted wings that are just as good as those that were fried or grilled! As excited as I am to tell you about this chicken, I also want to fill you in on one of my latest culinary finds. 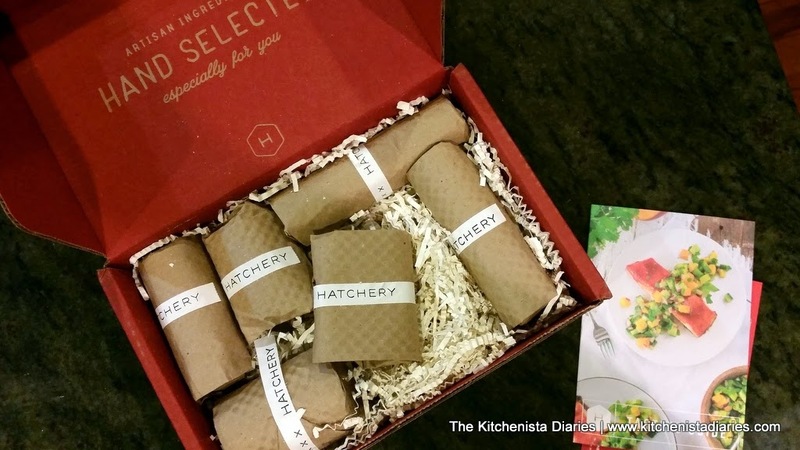 Hatchery is a subscription service that delivers artisan cooking products right to your doorsteps once a month. When you get your Hatchery box, you'll find a collection of hand selected sample-sized products that may include things like spice blends, sauces, jams and oils. The samples are the perfect amount to try in a new recipe, and Hatchery even starts you out with a few ideas in their Tasting Guide that comes with the box. There are also great discounts should you want to buy any full sized products from their site. At $25 per month, or $20 if you purchase a yearly subscription, this is one of those fantastic ideas that cooking enthusiasts like myself will appreciate. I don't know about you, but I tend to be somewhat of a product junkie when it comes to specialty food items. That can add up to quite an expensive habit, and to be honest can be a waste when you don't end up using or liking everything you bought on impulse. The advantage of a subscription service like Hatchery is that you really do get to try a variety of products from all over the country, for a fraction of the cost. And while that may sound like another sales pitch, it's really coming from an avid fan of the service. Needless to say, I was thrilled when Hatchery asked me to become a Brand Ambassador, because this is a product that I'm truly proud to represent. I've already seen a ton of my Twitter and Instagram friends jump on board, so I'm really looking forward to being able to see what you all create with your Hatchery products. Make sure you tag your social media shares with #hatcherymade for chances to win cool prizes every month from Hatchery! In the coming months, I'll be featuring recipes here on my site using products from my Hatchery boxes. In last month's box, my favorite item was definitely the cilantro infused cottonseed oil from Acala Farms. It's a lightweight, high-smoke point oil with a deliciously bright cilantro flavor. While it was perfect as a vinaigrette, on a whim I swapped it out for grape seed oil on my chicken wings and wow! 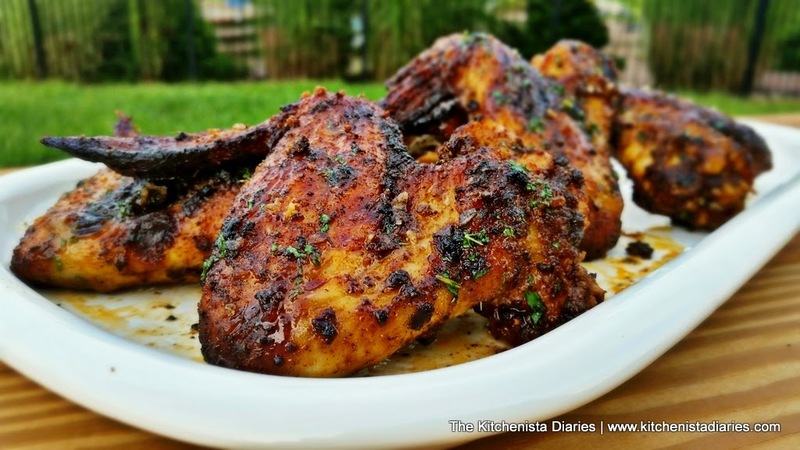 It gave my wings an amazing cilantro undertone to the spice blend, while achieving the perfectly crisp skin that I needed from the oven. 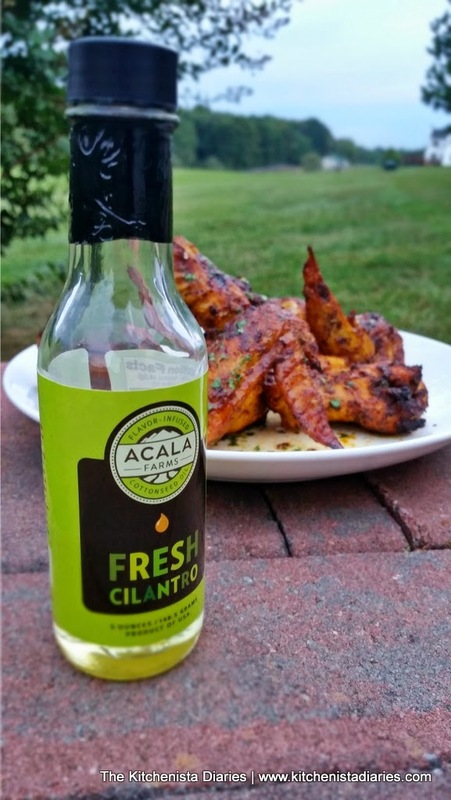 If you're a fan of cilantro, Acala Farms' oil is something worth checking out. I think it's more versatile than chopped herbs can be in applications involving high heat, so this will truly be perfect for the grill or oven broiling. And because the flavor is so concentrated, a little bit of oil goes a long way in adding flavor to your dish. First things first, get those wings into your brine since that's the longest part of the recipe. This buttermilk brine is super easy. Just dissolve 1/4 cup Kosher salt and several splashes of hot sauce into your buttermilk, using a container big enough to fit your wings. I didn't section my wings this time, and that's totally up to you as well. The wings I had were a great size and they plump up even more after the buttermilk soak, so I wanted to show that off and left them whole. You may be familiar with brining your pork and poultry in a saltwater solution, but did you know that you could do the same with buttermilk? It's the best of both worlds, really. The acidity and tang of a salty buttermilk brine tenderizes the chicken, keeps it juicy when cooked, and adds flavor all the way through the interior of the meat. 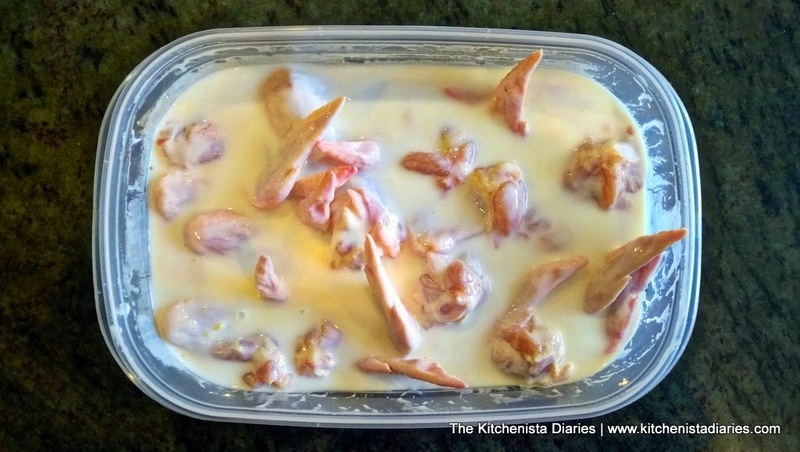 It's my new favorite way to brine chicken. I love how the buttermilk helps the chicken develop a bit of a crust when you throw it on the grill or roast it at high heat in the oven. Don't worry too much about the wing tips sticking out; as long as the flats and drummettes are submerged in the buttermilk you're good to go. Cover and refrigerate your container for at least an hour or up to 4 hours. 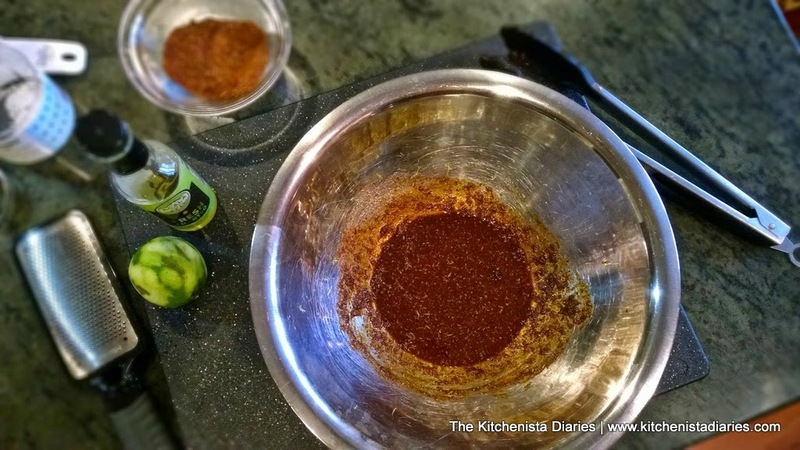 Meanwhile, mix up your spice blend by combining all of the spices and brown sugar. Reserve 1/4 cup of rub for the chicken wings, and save the rest in a resealable container. This is a fantastic rub and can be used for whatever else your heart desires - think of it as a Mexican rub turned up a few notches. The turmeric, smoked paprika and annato add a beautiful color and a hint of something "different" in the flavor. By the way, I keep most of my blends salt-free to make them more versatile in my recipes. My rule of thumb is to add about a teaspoon of kosher salt per pound of meat when I'm actually seasoning, and that's easy to adjust depending on the dish. When you're about ready to season your wings, preheat your oven to 425° F and arrange your oven rack to the level just above the middle. Line a heavy baking sheet with aluminum foil, and place an oven safe baking rack on top. This is something I started using recently when I'm roasting and even for cooking bacon. It helps the air to circulate around whatever you're cooking and allows grease to drip down into the pan. At around $15 or so, it's an easy investment to make in your kitchen. Just make sure you buy the kind that's oven safe. You'll also see "cooling racks" that look similar, but are not meant for the oven. In a large bowl, combine the cilantro oil, 1/4 cup spice rub and zest of 2 limes to make a wet rub. Save the limes for the honey drizzle later. I also added a couple teaspoons of flaked sea salt. 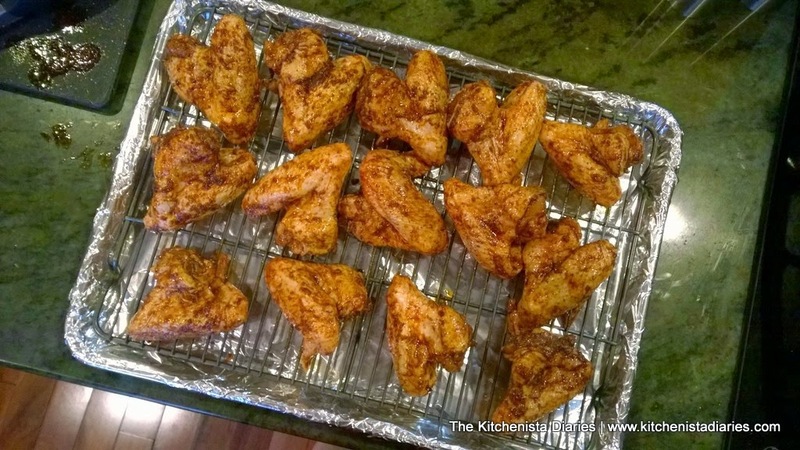 The flakes add a nice textural crunch on the outside of the wings when they bake. Optionally, a teaspoon of Kosher salt can be used instead. You're slightly under-seasoning the wings at this point because plenty of salt came from the buttermilk brine itself. Shake off the excess buttermilk from the wings and blot dry with paper towels as you add them to the mixing bowl where your wet rub is. 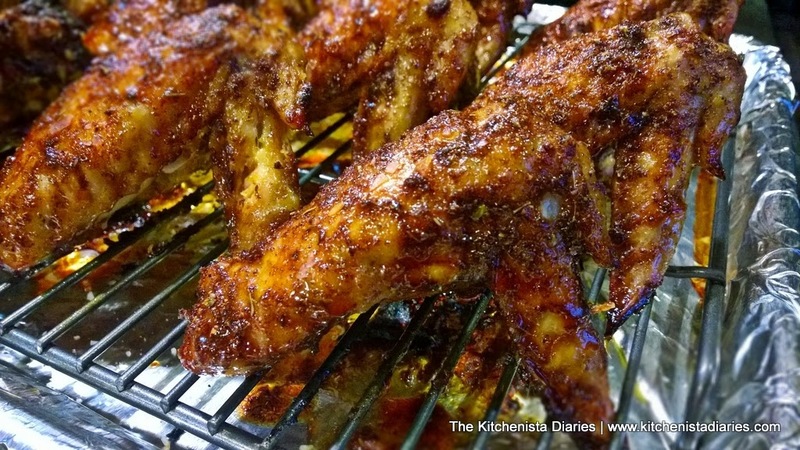 Use tongs (or your hands) to toss the wings until they are thoroughly coated. I really recommend a good pair of tongs though, they are safer than touching raw chicken and great for handling hot cooked foods as well. Arrange the seasoned chicken wings on the cooking rack, tucking the wingtip underneath as best possible to prevent scorching. 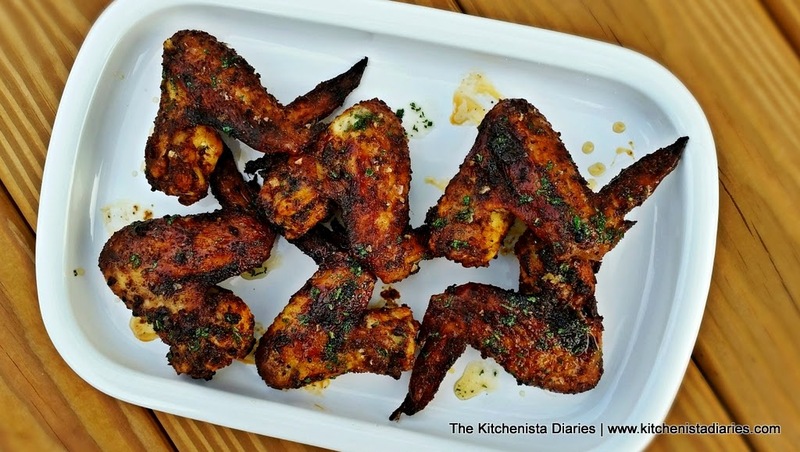 If there is any wet rub left in the bowl just drizzle it over the wings. Pop those babies in the oven and roast at 425° F for 25 minutes. I like to roast these at just above the center level in the oven. It's high enough to get some good color but not high enough to burn too quickly. After 25 minutes, remove from the oven to check doneness. 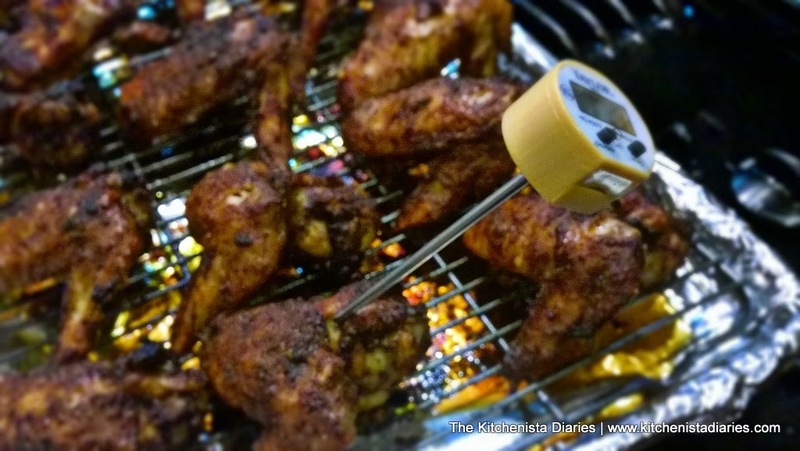 As this depends entirely on the size of your wings, an instant read thermometer is always your best bet for checking if the chicken is cooked. 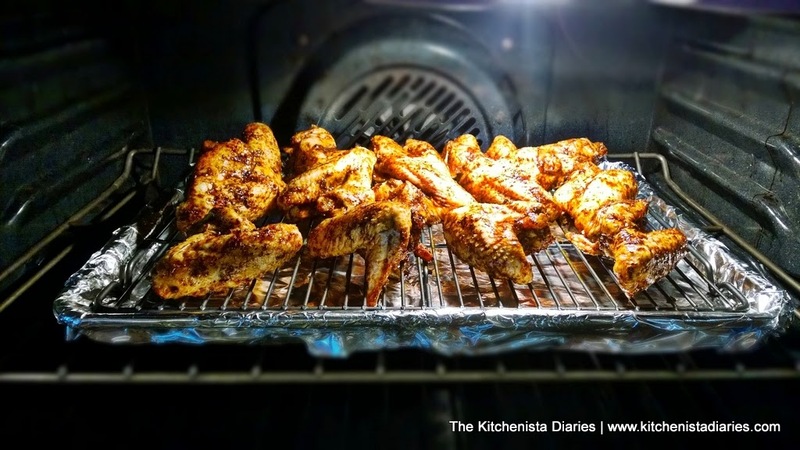 On average my wings cook for about 30 minutes at this high oven temperature so you may find that they need a few more minutes. You're looking for an internal temperature of 165° F for safely cooked chicken. Ordinarily I'd tell you to pull a whole bird out a lot sooner than that, as it will continue to cook with residual heat. 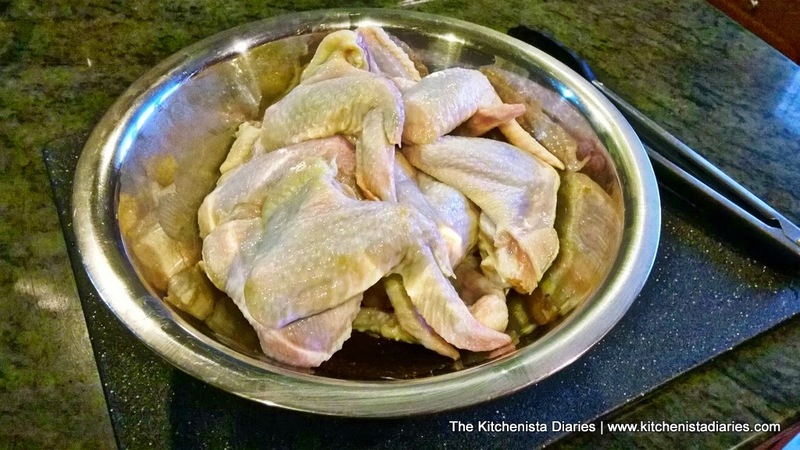 With brined chicken wings however, it's fine to get right up to 160 - 165° F without much worry of over cooking them. I've gone way over that and been just fine. The last thing you want to do at a party is serve undercooked meat, so always take the safe route and use a thermometer for accuracy. If you're cooking these wings without a rack, you may want to pull them out halfway through the cooking time to drain any excess grease from your roasting pan. This will help the skin get crispy. But seriously, you can't go wrong getting a rack and will use it all the time. 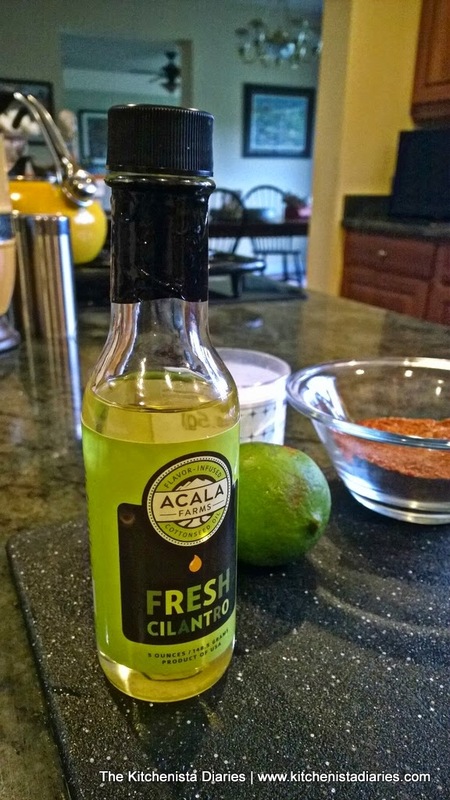 Meanwhile as my wings were cooking, I prepared a quick honey lime drizzle to finish them off. 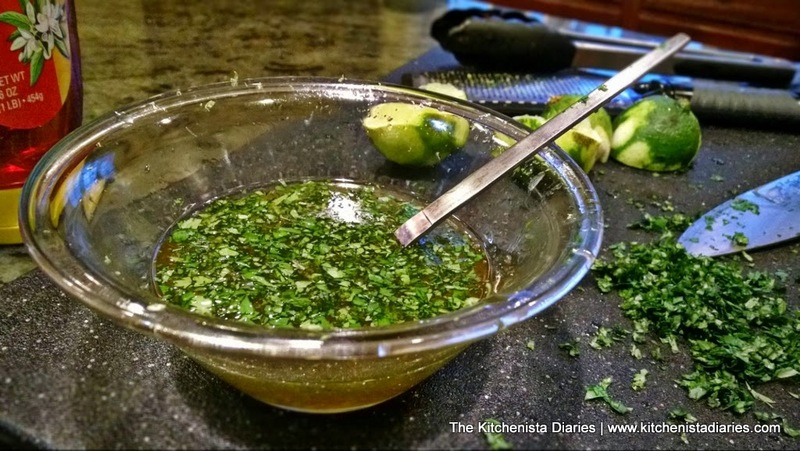 Combine the honey, chopped cilantro and juice of 2 limes. I love a good sauce for my wings, but because these have such a dynamic and perfectly crisp coating already, they really didn't need much else. This was a nice hint of sweetness and acidity to balance everything else out. Once your wings are cooked up, allow them to rest for a minute or two on the rack. Bask in their crispy glory and gorgeous color. Taste one, because you simply have to, but also to check your seasonings before serving. If you need it, a tiny sprinkle of Kosher or sea salt will finish them off. When you're ready to serve, transfer the wings onto your plate or serving platter and lightly drizzle with some of that honey lime sauce. Crispy, perfectly seasoned, juicy chicken wings from your very own oven. There's no way you're staring at this photo and aren't hungry yet. Don't forget to go and get that Hatchery subscription and see what kind of cooking inspiration you can find in the next box!